Mary Shelley reveals the main characters of her novel survived: Dr. Frankenstein - goaded by an even madder scientist - builds his monster a mate. Few films have permeated the public consciousness as 1931's Frankenstein and its 1935 sequel The Bride of Frankenstein. At this point, actually, the two have become melded within the general view; many people think of scenes from Bride as having appeared in the original, such as the bit where the monster meets the blind hermit. Bride is generally thought of as the superior of the two films, as it frequently appears in discussions of sequels that surpass the originals. I think that while the two pictures are clearly quite similar, enough differences exist to make comparisons verge upon "apples-oranges" territory. 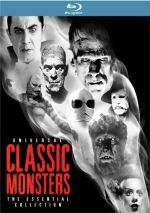 At the end of the first film, it appeared that Dr. Frankenstein (Colin Clive) and his monstrous creation (Boris Karloff) died. However, it turns out that they survived, and the Creature feels kinda lonely. Also blackmailed by sinister Dr. Pretorius (Ernest Thesiger), Dr. Frankenstein goes back to his old scientific ways – and now seeks to create a mate for his monster. The performances in Bride definitely veer toward broader, campier tones than the more somber and straightforward work in the original. Bride also provides more action and thrills and humor. In Frankenstein, director James Whale used a fair amount of restraint, but he goes completely over the top in the sequel as he aims for the fences. The actors deliver tremendously wide performances. Ernest Thesinger's wickedly ominous Dr. Pretorious and Una O'Connor's wild-eyed and shrieky Minnie seem most active, but everyone's pretty broad. Even Clive appears to emote more strongly than he did during the first movie. One other acting difference between the films comes from Victor's fiancée Elizabeth. In the first film, we saw blonde Mae Clarke in the role, but brunette Valerie Hobson appears in the sequel. (Apparently Clarke was too ill to star in Bride so the part was recast.) In keeping with the difference in the film's tenor, Hobson's much broader than the fairly subdued Clarke. Both films clearly show some age, since film styles have changed so much over the intervening decades, but I found both to be very entertaining and effective. Karloff remains effective and engrossing as the monster, and Whale makes both stories come alive in exciting and dramatic ways. Despite the fact most people have an extreme familiarity with the stories, the executions works well and makes them both very compelling. 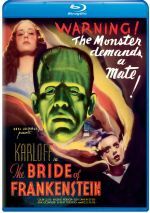 The Bride of Frankenstein appears in an aspect ratio of 1.33:1 on this Blu-ray Disc. Given the movie’s age, the transfer dazzled. Overall sharpness looked positive. At times, I thought wider shots appeared a smidgen soft, but those examples created only minor distractions. The majority of the flick provided quite good definition. No issues with jagged edges or shimmering appeared, and I noticed no edge enhancement. Natural grain appeared here, so the flick maintained a nice film-like appearance. Blacks seemed solid. The film’s many dark shots demonstrated fine depth and contrast looked positive. Low-light shots occasionally seemed a little murky, but they usually offered acceptable to good delineation. Source flaws were minimal; occasional instances of small specks appeared, but these were rare. Honestly, this was a revelatory presentation of the film. I also felt the DTS-HD monaural soundtrack of Bride held up well for its age. Speech showed a thin, trebly side but was perfectly acceptable and lacked significant edginess or other flaws. Music popped up sporadically and showed a tinny side as well, but the score was reasonably clear given its vintage. Effects were a bit harsh but didn’t suffer from significant distortion. Only a little background noise appeared along the way, so the audio remained fairly quiet. I felt that the audio worked pretty well within the expectations of its era. How did the Blu-ray compare to the original DVD from 1999? Audio seemed smoother and less harsh, while the visuals came across as cleaner, tighter and more natural. The Blu-ray offered a tremendous upgrade, especially in terms of picture quality; the Blu-ray blew away the unappealing DVD image. In terms of extras, the set leads off with an audio commentary from film historian Scott MacQueen. He provides a running, screen-specific look at story/character areas, the script and various versions/changes, censorship issues, cast/crew notes, cinematography and music, other production areas and the movie's release/impact. My only negative impression of MacQueen's commentary relates to dead air, as we find a lot of empty spots - too many for such a short movie. However, the content of the track adds lot of good information, so I can't complain about MacQueen's material. Even with the blank spaces, we learn many fine notes about Bride in this engaging chat. Hosted by filmmaker Joe Dante, She's Alive: Creating The Bride Of Frankenstein goes for 38 minutes, 54 seconds and includes notes from MacQueen, Father of Frankenstein author Christopher Bram, film historians Paul M. Jensen, Gregory W. Mank and Bob Madison, Boris Karloff’s daughter Sara, author/filmmaker Clive Barker, Gods and Monsters writer/director Bill Condon, makeup artist Rick Baker, and actor’s son Dwight D. Frye. “Alive” covers the original Frankenstein and the development of the sequel, cast and crew, story, characters and performances, makeup and effects, sets and production design, music, censorship and cut sequences, themes and interpretation, and the film’s legacy. The documentary offers a fairly satisfying overview of Bride. Within the Bride of Frankenstein Archive, we find a running compilation of images. This 13-minute, 11-second reel shows various ads and production photos. I’m not wild about the format – I’d prefer a standard still gallery – but I like the content. In the Trailers Gallery, we find four promos. This area includes clips for Frankenstein, Bride of Frankenstein, Ghost of Frankenstein and House of Frankenstein. Finally, the set finishes with a featurette called 100 Years of Universal: Restoring the Classics. It goes for nine minutes, 13 seconds and offers statements from Universal Studios Vault Services VP of Image Assets/Preservation Bob O’Neil, Universal Studios Technical Services VP Peter Schade, Kodak Pro-Tek Media Preservation VP of Preservation Services Rick Utley, Universal Studios Digital Services engineer Henry Ball, Universal Studios Technical Services mastering supervisor Phil Defibaugh, Universal Studios Technical Services mastering supervisor Ken Tom, and Universal Studios Technical Services supervising sound editor John Edell. “Restoring” covers all the procedures used to bring Bride and other movies to Blu-ray. It’s a reasonably informative take on the subject. Note that the same featurette also appears on the Frankenstein Blu-ray. While The Bride of Frankenstein may not shock and terrify audiences like it did in 1935, it remains entertaining and compelling. The Blu-ray delivers excellent picture, positive audio and a small but informative set of supplements. The movie holds up well and looks better than ever on this terrific Blu-ray.